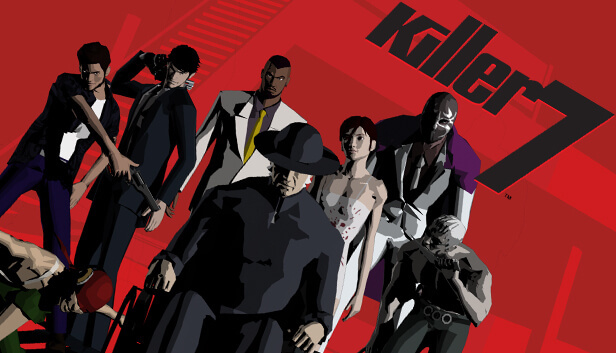 killer7 is at last available for PC on steam. Publisher NIS America has already implemented some of the important updates. The game was initially released in 2005 for console, killer7 is a storytelling game from SUDA51. The updates that are implemented into the game, includes the improved frame rate over the entire game except reload animation, plenty of key bindings configuration and more. "All drawn animation sequences have been upgraded to fit the new 16:9 aspect ratio offered by modern computer devices. You can see an example here. The entire game is rendered at 60 FPS except the “reload” animation. We found that increasing the frames to 60 FPS during the “reload” animation introduces unwanted artifacts at every other frame, so in order to keep the behavior true to the original, we’ve locked this animation to 30 FPS. Ultimately, our goal was to update as many parts of the game as possible without compromising the quality of the gameplay, and we aimed to achieve that with how the game was presented and experienced as a whole. Players can now quickly swap between Harman’s different personas using the number keys 1-6 on the keyboard (configurable). Many 2D puzzles that were originally made in 4:3 ratio have been reworked to 16:9 ratio. Many 2D assets have updated textures to match the new 1080p resolution offered by current computer devices. This ensures that while the resolution is higher, everything appears crisp and clear. All of Travis's shirts are crystal clear in the Steam version!" Killer 7 is available on Steam for buy.